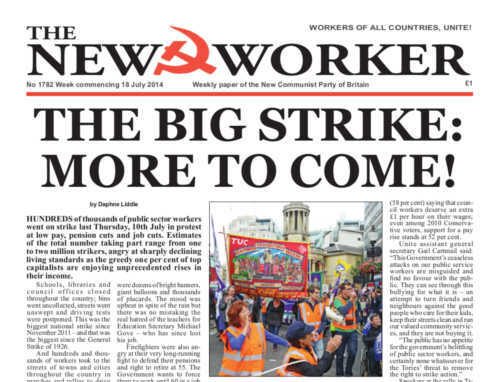 www.newworker.org | 18th July 2014 - The big strike: more to come! ISRAELI warplanes are pounding the Gaza Strip. Over 200 Palestinian Arabs have been killed and many more wounded. Most of them were civilians. But in the White House and the chancelleries of the European Union we hear no call for the “no-fly” zones or “humanitarian corridors” that they’ve used to justify imperialist aggression in Iraq and Libya and resurrected in last year’s abortive attempt to drum up support for an invasion of Syria. While millions all over the world have taken to the streets to show their solidarity with the people of Gaza the bourgeois media remains silent about the root causes of the Palestinian problem. Israeli claims are taken at face value by the BBC and no attempt is made to explain the plight of the Palestinian refugees or Israel’s intransigence and portrays the monstrous Israeli assault as an act of “self-defence” against Palestinian terror. The Cameron government and the rest of the imperialist pack of wolves talk about their “concern” and make half-hearted appeals for a ceasefire to an Israeli regime that is economically dependent on US aid and is essentially an American protectorate. Tory Party reshuffles rarely concern working people. Few will shed a tear at the departure of the useless William Hague from the Foreign Office or Michael Gove’s transfer out of Education. Two Europhiles, including veteran politician Kenneth Clarke, have been dumped and a number of Tory women MPs have been elevated to replace some of the older male nonentities in the Cameron team. But all in all David Cameron’s changes are purely cosmetic and are simply designed to build a Conservative front-bench slate best able to head off the Ukip challenge from the right at the general election next year. Workers have little say in whoever rules them in this country let alone those chosen by the ruling class to represent the interests of the capitalists and landowners in Parliament. But we do have a say in those who claim to represent us in the labour movement and the Labour Party it largely funds.